Support the POG Foundation with your purchase of a Sparkle Hoodie! 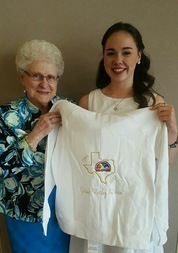 The Texas Pot of Gold Foundation is a non-profit association formed for the general purpose of active promotion and support of the members of the International Order of the Rainbow for Girls in Texas. These purposes will be achieved by providing opportunities for self-improvement through education and leadership training programs, scholarships and grants, and such other activities that will contribute to the welfare of its members in their mental, physical, moral and spiritual development. All members of the International Order of the Rainbow for Girls in Texas will have the opportunity for financial assistance in obtaining education beyond high school. Scholarships will be designated for college as well as trade or occupational schools. The Texas Rainbow Pot of Gold Foundation, Inc. is a charitable organization under section 501(c)(3) of the Internal Revenue Code. Your contribution is deductible as provided by law.